Recently I was looking for Games written in Perl/Tk. I like games and I like Perl and I like games in Perl/Tk because I can compile them (unlike games in Perl/SDL - unfortunately) and provide them to friends. I found an old Tetris-like game on backpan: Petris. It was written by Mark Summerfield around 1998/1999 or so. Out of curiosity I tried to get it to work. After the installation of Tk::MesgBox, a module which I only found on backpan it worked quite fine. 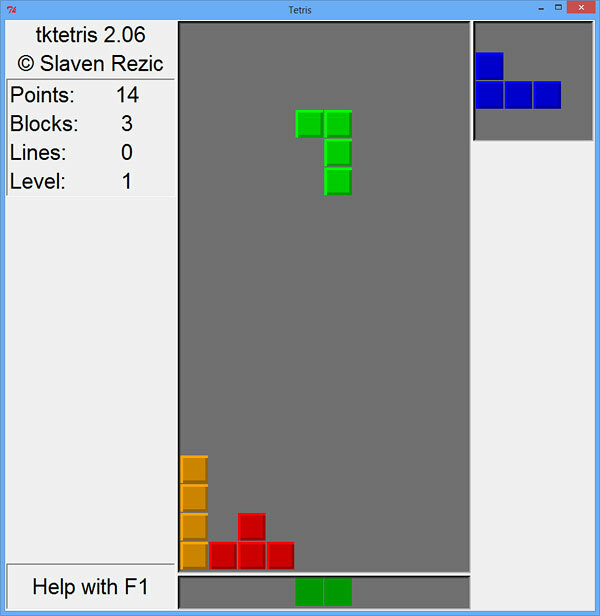 While woring on the code (firest getting rid of Tk::MesgBox, then making Perl modules from the set of Perl files) I found another implementation: tktetris. Playing Tetris and doing Perl at the same time is now possible. I found it quite hard to find other Games in Perl/Tk. I thought there were more of them. In a German bulletin board I found a memory game (see screenshot here). There seems to be some, e.g. tkt - a Perl Solitaire game by Greg Bacon. There are also some videos on youtube like this Pacman clone and again, Tetis (incl. sound). There is some stuff in plain Tcl/Tk here which might be ported. I have collected also several of Perl games, mostly or all Tk. If you like them, send me mail. Hopefully fixed in the new version.